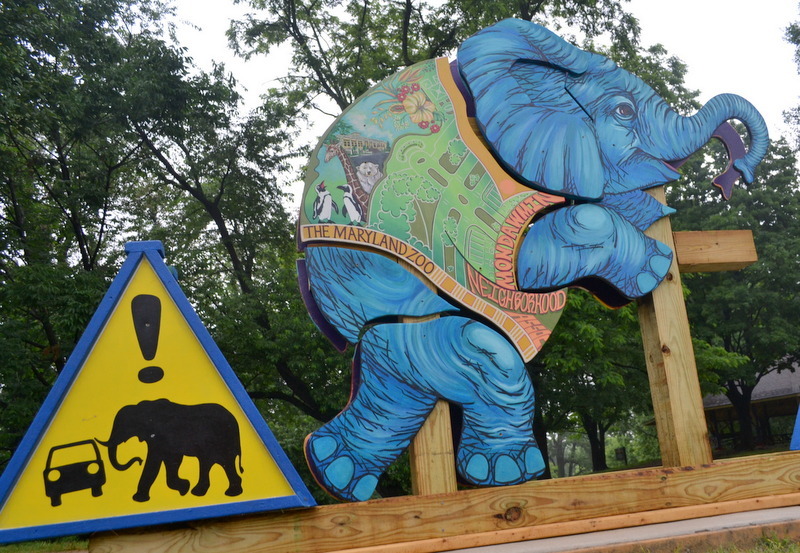 A small herd of metal pachyderms will be unveiled today on the west side of Druid Hill Park. A community project long in coming. Above: New elephant sculptures, installed at the intersection of Gwynns Falls Parkway and McCulloh Street, are meant to calm traffic. Mondawmin residents and local artists have found a novel way to slow down traffic: Elephants. No, they didn’t let out the ones from the zoo. 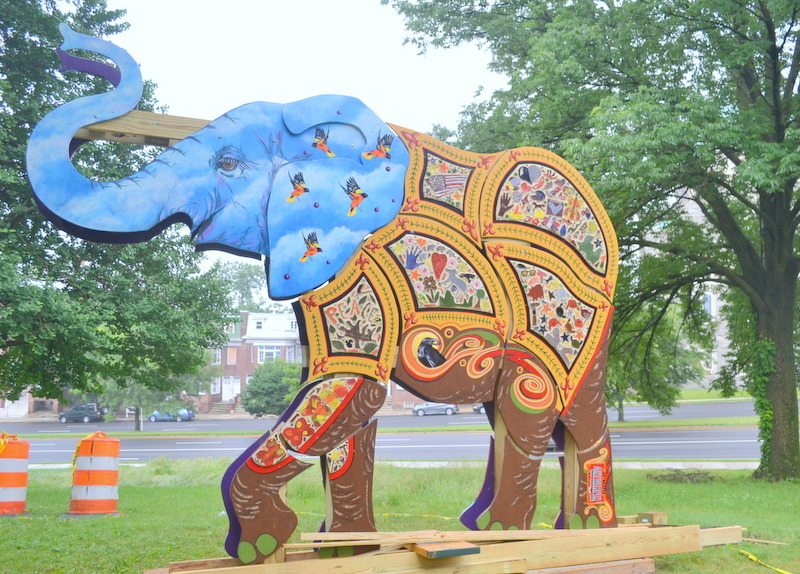 Instead, five painted steel pachyderms have been stationed along Druid Park Lake Drive, McCulloh Street and Auchentoroly Terrace. The elephants — two mothers and three babies — are being officially unveiled later today, although organizers have been installing them on the roadside leading to the Maryland Zoo in Baltimore since last week. One part traffic calming and one part community art project, the stationary elephants are meant to exude wisdom, said Deborah Patterson, founder of the Hampden nonprofit ARTblocks and one of the project’s organizers. But true to their flesh-and-trunk counterparts, the elephant project has slowly lumbered to fruition. Back in 2011, residents in the Mondawmin Neighborhood Association and New Auchentoroly Terrace Community Association got together with Patterson to talk about traffic issues at the intersection of Gwynns Falls Parkway and McCulloh Street. A pair of elephant sculptures was supposed to be installed in the fall of 2012, but that’s where the project hit its first snag. “They were planning to move the water main so we could install the elephants, but we didn’t know when exactly that would happen, and the way the city is replacing them and having to do public works, we needed more of a guarantee,” Patterson said. So they moved the elephants. Two sculptures eventually turned into five and costs ballooned upward, Patterson said. The project won a $20,000 PNC Transformative Art Prize from the Baltimore Office of Promotion and the Arts in 2012. But Patterson discovered she needed more, she said, and came up with an additional $20,000 through grants from the Maryland Zoo, Antwerpen Motors, an anonymous donor and thousands she raised herself. She still needs to raise $5,000, she said. The elephants now form a procession of sorts from near their once-planned perch to the zoo’s entrance at Auchentoroly Terrace and Greenspring Avenue. But most important to Patterson was the community’s involvement. The sculptures made by Baltimore artist Barbara Thompson are adorned not only work by her art, but the work and input of residents and Westside Elementary School students. “Unless you engage the whole community, the whole cloth of the community, you’re not going to make real change. You really need everybody’s ideas, you need everybody to know that it’s their project, feeling ownership of it,” Patterson said. Residents and local officials didn’t forget about the McCulloh intersection either. Councilman Nick Mosby said his office and residents have had “several charrettes and placemaking opportunities and meetings” with city transportation officials about the intersection. Patterson noted that they planted daffodils at the intersection and that Mosby got new crossing signage. As for Patterson, she says the elephants project was by far one of the hardest things she’s ever had to do, she has not a single regret. She focuses mainly on the way it brought the community together. “We have built relationships that are so broad, I cannot begin to tell you. It makes me cry,” she said.